RALEIGH – As fall wildfire season approaches, the N.C. Forest Service encourages North Carolinians to heed the call of National Fire Prevention Week, Oct. 8-14, and take steps to ensure careful burning of leaves and yard debris. Consider alternatives to burning. Some types of debris, such as leaves, grass and stubble, may be of more value if they are not burned, but used for mulch instead. 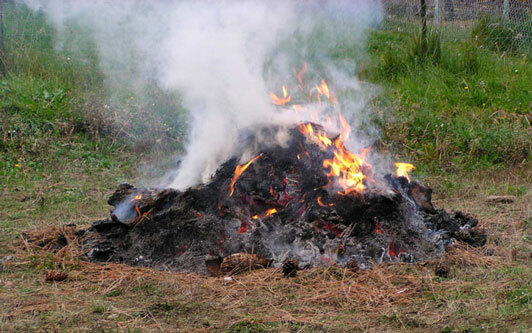 Local fire officials can recommend a safe way to burn debris. Don’t pile vegetation on the ground. Instead, place it in a cleared area and contain it in a screened receptacle away from overhead branches and wires. These same tips hold true for campfires and charcoal grills as well. Douse burning charcoal briquettes or campfires thoroughly with water. When soaked, stir the coals and soak them again. Be sure they are out cold and carefully feel to be sure they are extinguished. Never dump hot ashes or coals into a wooded area. 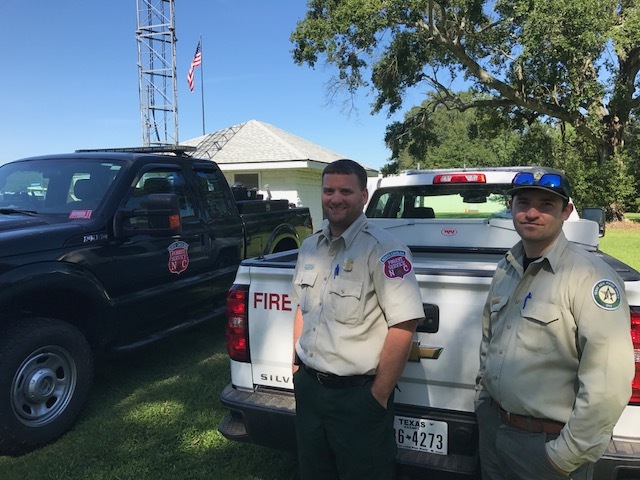 NCFS Harvey Team Six Division Supervisor Kyle Powell, left, pictured with Texas A&M Forest Service Team Liaison Jared Karns. 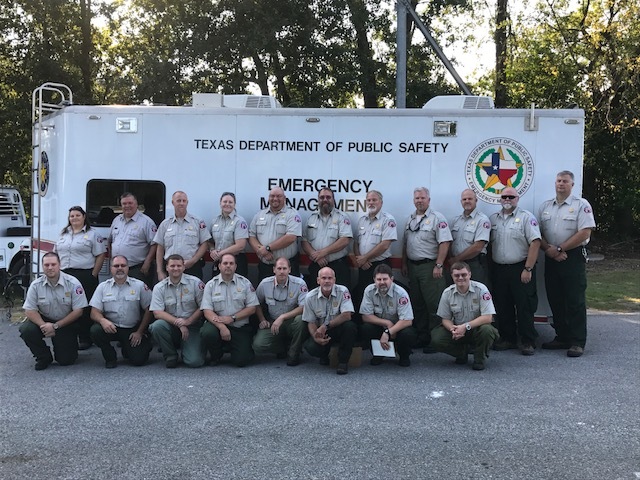 BEAUMONT – After much discussion, the 19-member North Carolina Forest Service Harvey Team Six is heading home to North Carolina. After Governor Cooper’s declaration of a State of Emergency, it became evident that the team needed to return home to prepare for possible emergency response in the state of North Carolina. Columbus County Assistant County Ranger Kyle Powell is one of the team members on NCFS Harvey Team Six as a Division Supervisor. “Overall the dispatch has been a good experience for everyone. All of the Texas folks here at the DDC (District Disaster Committee 15) and everywhere have been friendly and accepting of our presence. We have tried to provide the best assistance we could to help their mission and help them to carry out the task at hand. They had been working so long already and many had lost their homes from the flooding. I’m glad we were able to come assist the Texas A&M Forest Service since they have come to support us on many incidents in the past,” said Powell. Most recently, delegates from the Texas A&M Forest Service were dispatched to help with the Western Severity wildfires in the mountains of North Carolina last fall. The team will begin traveling home early Friday morning, well ahead of Irma’s current projection to make landfall on the east coast Sunday or Monday. BEAUMONT – The North Carolina Forest Service has sent a Type 3 Incident Management Team (Hardee) to Texas to help with Hurricane Harvey emergency response. The team of 19 Forest Service employees arrived Sunday afternoon, after traveling two days to southwest Louisiana then a partial day to navigate around flooded areas to arrive at their destination in Beaumont, Texas. The team has been requested by the Texas A&M Forest Service to assist local government officials in Hardin, Jefferson, and Orange Counties with their District Disaster Committee’s (DDC) emergency response mission..
"Woodlands are often more resilient than we think and will likely recover," said Agriculture Commissioner Steve Troxler. "If you’re a landowner concerned about your woodlands, talk to your county ranger or a consulting forester who can help you determine if you need a plan for managing damaged timber." A management plan should be requested as soon as possible to assess the extent of any damage and mitigation measures. A sketch map or aerial photograph of the affected area can also be helpful. The next step is to ground check the damage to determine the need for salvaging the timber. Any salvage operation will depend on location, amount and type of damage, and management objectives. It is important landowners have a written contract before selling any of their salvage timber to protect their financial interests. A consulting forester can help you with appraising the value of your timber and what markets may be available. If you don’t already have a management plan for your woodlands this would also be a good time to consider having one written. This will help with planning for the future of your woodlands once the damage is cleaned up. Visit the N.C. Forest Service at ncforestservice.gov and follow the links under “Managing Your Forest” to learn more about recovering from storms and fires. You can also find contact information for your county ranger who can provide you with additional advice on managing your woodland Learn more. Watch for downed utility lines and treat them all as live until a utility company official has told you the line is not energized. Even cable TV lines can carry electric current if they contact a power line. Be safe with chainsaws. Operation of a chainsaw in normal conditions can be dangerous. In the aftermath of a storm is not the time for inexperienced users to learn. Work with an established, local tree service, if you lack the experience to do the work. Hire only an International Society of Arboriculture (ISA) Certified Arborist if you are unable to care for your tree correctly and safely. After a storm, some homeowners are reluctant to replace downed trees, while others choose to remove trees regardless of how well they survived the storm. Tree damage and tree failures can cause property damage, but the possibility can be managed through proper maintenance. Prepare your trees to withstand these events, to help to preserve the benefits you enjoy from having trees around your home. Know how to manage storm damaged trees, to help retain or even regain those many benefits we all enjoy. RALEIGH – The emerald ash borer (EAB) was found in Surry County for the first time, making it the 33rd county within the state where this invasive insect has been detected. The EAB was found near Pilot Mountain State Park, where declining trees with symptoms consistent with EAB were found. Upon closer inspection, EAB larvae, the immature stage, were found beneath the bark of ash trees. EAB is a metallic green beetle that bores into ash trees and feeds on tissues beneath the bark, ultimately killing the tree. The signs and symptoms of EAB aren’t always immediately noticeable because EAB damages the inside of the tree. Adult borers lay eggs on the bark of ash trees. When the eggs hatch, the larvae bore into the bark and feed on the transportation tissues of the tree. This disrupts the movement of nutrients and water within the tree, causing the tree’s slow death, typically in three to five years. The signs and symptoms of EAB infestation include thinning and dying crowns; increased woodpecker activity that causes the tree to look like it is losing patches of bark; small, 1/8-inch D-shaped exit holes where adult beetles emerged from the trees; galleries on the inside of the bark; cream-colored larvae; and epicormic sprouting, or sprouting from the main stem of the tree. Host plants include all native ash trees and native white fringetree. The Chinese white fringetree, often planted for ornamental purposes, is believed to be resistant. EAB, a non-native invasive insect from Asia, has been found in the following counties: Alamance, Avery, Buncombe, Cabarrus, Caswell, Catawba, Davidson, Durham, Forsyth, Franklin, Gaston, Graham, Granville, Guilford, Haywood, Iredell, Johnston, Lincoln, Madison, Mecklenburg, Mitchell, Orange, Person, Randolph, Rockingham, Surry, Swain, Vance, Wake, Warren, Wayne, Wilson and Yancey. The entire state of North Carolina is under a quarantine for EAB. This prohibits the movement of ash plant parts, the insect itself, ash nursery stock and all hardwood firewood into non-quarantined areas such as South Carolina or central Tennessee. Adult EAB beetles are about a half-inch long and 1/8-inch wide. If their wing covers are pried up, their bodies are a metallic purplish-red color. In North Carolina, the adult EAB is typically active from late spring and early summer, likely April through June. EAB larvae may be found under the bark of the tree most of the year. For more information about EAB, visit the North Carolina Forest Service website and follow the links under the “Forest Health” section. To view current federal EAB quarantines, visit the national EAB website, www.emeraldashborer.info. The spread of invasive insects in the state is often due to human activity through the transportation of infested wood products such as firewood. It is strongly recommended that people burn local or treated firewood to reduce the spread of invasive pests. The North Carolina Forest Health Branch monitors the spread of invasive pests. People who suspect there is an infested tree in an area near them should contact their county ranger. Don’t use fireworks such as ground spinners, firecrackers, round spinners, Roman candles, bottle rockets and mortars, which are illegal in North Carolina. Do not use fireworks while under the influence of alcohol. Always use in a large, open and, preferably, paved area or near a body of water. RALEIGH - The N.C. Forest Service Nursery Program will begin accepting orders for seedlings July 3. The NCFS produces about 16 million quality seedlings for 47 species of both conifer and hardwoods annually, including an expanded selection of control mass pollinated loblolly pine seedlings. These seedlings offer superior growth, form and disease resistance. “Trees are one of North Carolina’s greatest renewable resources and an important economic driver in North Carolina, contributing around $24 billion annually to the state's economy and providing more than 180,000 jobs for North Carolinians through the forest products industry,”said Agriculture Commissioner Steve Troxler. The NCFS nursery program offers a large, reader-friendly catalog for ordering tree seedlings. Landowners can find information about the types of tree species, quantities and costs on the inside pages of the catalog. Each tree description includes information about ideal planting locations and whether a species is typically used for the benefit of wildlife, to restore habitats or as marketable timber. Hardwoods can be purchased in quantities as small as 10 seedlings, and conifers in quantities as low as 50. For larger orders, the nursery will continue to sell seedlings by the hundreds and thousands. Demand for these seedlings is up, so it is advisable to order early. Distribution of seedlings begins in the fall, depending on weather conditions. Seedling orders are shipped to one of 13 locations statewide for a small fee or via UPS for a charge. For information on planting trees, people may contact a local county ranger, who can be found on the contact page of the NCFS website. Catalogs are available at local NCFS offices, which are located in all 100 N.C. counties. The catalog is also available at the "Tree Seedlings & Nursery Program" link on the NC Forest Service Website. You can also visit the online seedling store. Seedlings can be ordered by mail or by calling 1-888-NCTREES (1-888-628-7337). Visa or Master Card payments accepted. Completed order forms should be mailed to Seedling Coordinator, 762 Claridge Nursery Road, Goldsboro, NC 27530. RALEIGH – Add Cabarrus and Mitchell to the list of North Carolina counties where the emerald ash borer has been discovered. The invasive pest, which was discovered in the Asheville city limits in early June, has now been confirmed in 27 counties. EAB, a non-native invasive insect from Asia, has been found in the following counties: Buncombe, Cabarrus, Catawba, Davidson, Durham, Forsyth, Franklin, Gaston, Graham, Granville, Guilford, Iredell, Johnston, Lincoln, Madison, Mitchell, Mecklenburg, Orange, Person, Randolph, Swain, Vance, Wake, Warren, Wayne, Wilson and Yancey. Adult EAB beetles are about a half-inch long and 1/8-inch wide. If their wing covers are pried up, their bodies are a metallic purplish-red color. In North Carolina, the adult EAB is expected to be active in late spring and early summer, likely April through June. EAB larvae may be found under the bark of the tree most of the year. For more information about EAB, visit "http://www.ncforestservice.gov">the forest service website and follow the links under the “Forest Health” section. To view current federal EAB quarantines, visit the national EAB website. The North Carolina Forest Health Branch monitors the spread of invasive pests. People who suspect there is an infested tree in an area near them should contact their county ranger. The contact information can be found online follow the links under the “contacts” heading. A combination of fire growth and burnout operations increased the fire size to 1,405 acres. The acreage number was also improved by air mapping of the fire footprint. Containment also rose to 15 percent. Yesterday’s burnout operations on the northern and western sides of the fire were successful. Today’s operations include patrolling and extinguishing remaining hotspots near established containment lines on the western, northern and eastern sides of the fire. Additional assessment and planning to contain the fire to the south is ongoing. Structure protection will continue in the Ashford and North Cove communities. Lighter winds and cooler nighttime temperatures prevailing into the weekend, may cause ground level smoke to occur in communities near the fire. A Code Orange Air Quality Action Day has been issued by the N.C. Department of Environmental Quality for Burke and McDowell Counties. An Action Day means particulate concentrations within the region may approach or exceed unhealthy standards. Area residents and visitors with respiratory sensitive conditions should take appropriate actions. Avoiding outdoor activities, keeping doors and windows closed and operating air conditioning systems are some common practices to avoid smoke inhalation. A community meeting will be held tonight at the Woodlawn Baptist Church in Marion. The meeting will start at 7 p.m.; fire officials will review progress on suppression operations and respond to questions about the fire. The wildfire has caused some trail closures, including a portion of the Mountains to Sea Trail being used to contain the fire. All forest trail and forest road closures can be found on the National Forests in North Carolina website. Additional personnel and equipment resources have been brought in to fight the fire. The number of personnel assigned to the fire has increased to 180. The Incident Command Post is operating out of the McDowell Technical Community College Small Business Center, known as the Universal Advanced Manufacturing Center. Additional fire information can be found on INCIWEB. 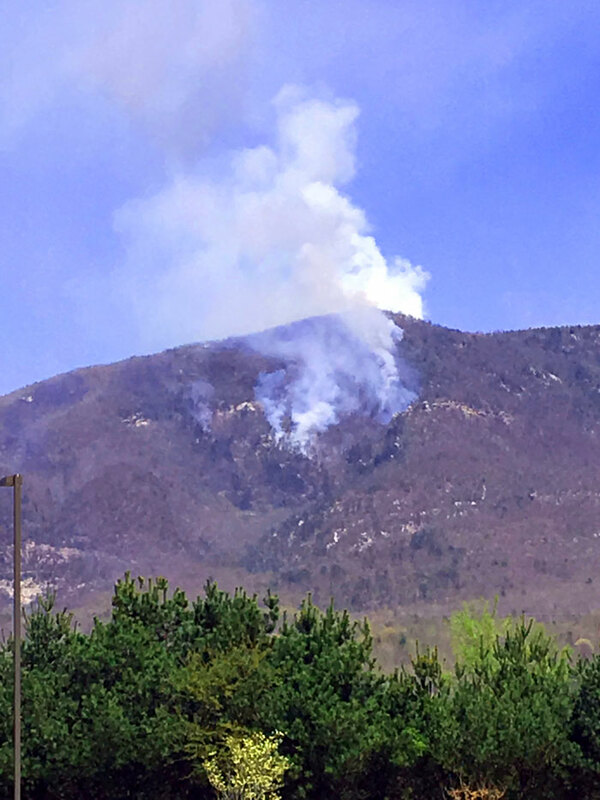 The Dobson Knob Fire is now 550 acres and 10 percent contained. Successful burnout operations occurred yesterday east of the fire using the Mountains to Sea Trail as a fire break. Additional burnout operations are planned for today on a dozer line completed north of the fire that connects Forest Road 106 (Dobson Knob Road) to Old Linville Road. To the west of the fire, structure protection will continue and firefighters will burn out hazardous pockets of fuel. The fire is somewhat limited in growth and intensity to the south due its proximity to the Bald Knob Fire footprint that consumed a major amount of hazardous fuel in 2015. Today’s forecasted higher humidity and calm winds should moisten fine fuels and moderate fire behavior. Light northwest winds may push smoke to the south and east, creating a haze or light ground smoke to form in surrounding communities. There is a slight chance of afternoon showers and thunderstorms that could further wet fuels; however, the gusty, erratic winds that can accompany thunderstorms may temporarily increase fire behavior. A community meeting will be held tomorrow at the Woodlawn Baptist Church in Marion. The meeting will start at 7 p.m.; fire officials will review progress on suppression operations and respond to questions about the fire. The U.S. Forest Service and N.C. Forest Service fire officials caution anyone attempting to operate a drone in and around the fire footprint. 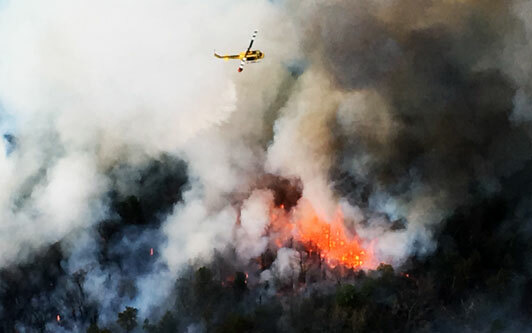 Unauthorized drones pose a real danger to aircraft and flight personnel assigned to fire operations, and are prohibited from use around wildfires. Additional fire information can be found on INCIWEB. RALEIGH – People often expect insects to be most active in the warm days of summer, but pine bark beetles can be active any time of year. Kelly Oten, forest health monitoring coordinator with the N.C. Forest Service, tells landowners with pine on their property what they should look for so pine bark beetles don’t leave them pining for healthy trees. Adult and immature beetles feed beneath the bark, creating winding tunnels that can be seen if the bark is peeled off, Oten said. These galleries prevent nutrients and water from traveling within the tree, effectively choking it. Most bark-beetle activity occurs in pines that are stressed or weakened by another factor. The current drought in Western North Carolina leaves many pines susceptible to beetle attack. Other factors that may increase susceptibility to attack are nutrient deficiencies, mechanical damage and lightning strikes. There are a few types of bark beetles that attack pine trees in North Carolina. The Ips engraver beetles are likely the most common. They rarely attack healthy trees and generally infest small groups or scattered pines. They can cause branches or the entire tree to die. Generally, the southern pine beetle also attacks weakened trees. However, it can reach outbreak levels and become extremely destructive, Oten said. When this happens, healthy trees are also attacked and a quick response is necessary. This response typically involves cutting down the infested pine trees and surrounding trees to create a buffer. Landowners suspecting bark-beetle activity in their trees should contact their N.C. Forest Service county ranger, who can assist with identification and offer forest management advice. To find your county ranger visit the main contact page. RALEIGH – After 47 years of production, the N.C. Forest Service’s Linville River Nursery in Crossnore will cease operations June 30. Make sure you have an approved burning permit, which can be obtained at any NCFS office, county-approved burning permit agent, or online at ncforestservice.gov. If you must burn, be prepared. Use a shovel or hoe to clear a perimeter around the area where you plan to burn. Stay with your fire until it is completely out. In North Carolina, human carelessness leads to more wildfires than any other cause. In fact, debris burning is the No. 1 cause of wildfires in the state. These same tips hold true for campfires and barbecues, too. Douse burning charcoal briquettes or campfires thoroughly with water. When the coals are soaked, stir them and soak them again. Be sure they are out cold and carefully feel to be sure they are extinguished. Never dump hot ashes or coals into a wooded area. Burning agriculture residue and forestland litter: In addition to the guidelines above, a fire line should be plowed around the area to be burned. Large fields should be separated into small plots for burning one at a time. Before doing any burning in a wooded area, contact your county ranger, who will weigh all factors, explain them and offer technical advice.